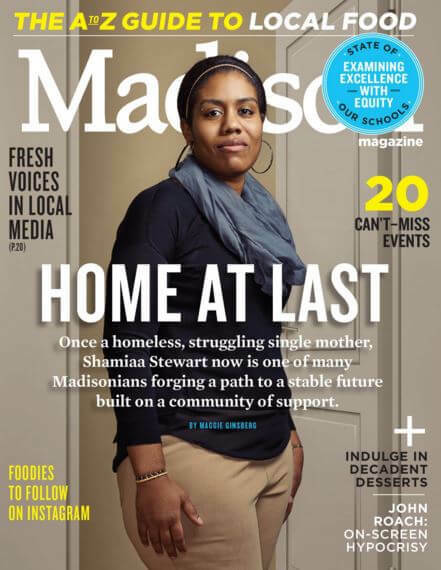 Madison, Wis. – Shamiaa Stewart first experiences homelessness in 2004, when she’s only nineteen. On the outside, she’s a legal adult. On the inside, she’s a child who has never known stability. The oldest of nine children born to drug-addicted parents, Stewart spends her first twelve or thirteen years with her family in a cramped apartment, the power often cut, the refrigerator usually empty. It’s a cold, claustrophobic struggle, until Child Protective Services pulls the kids out of the home. After a couple of placements don’t work out, fifteen-year-old Stewart, who battles severe clinical depression, is sent to live at a residential facility for children with mental health issues. She runs away more than once. She’s looking forward to her eighteenth birthday so she can leave the system and the system ad reunite with her mom, who’s gotten clean and left Stewart’s dad, who hasn’t. But just days after she turns eighteen, her mom dies suddenly of a brain aneurysm. And so Stewart, now finally of legal age but with nothing to her name but a last resort, moves in with her father in 2003. One year later, her dad is evicted.